For IAM traffic measurement for inbound/outbound, does anyone have the experience of comparing between IAM and any other vendors' products? For my experience, I used to face that IAM log said both outbound / inbound traffic too high like 5 mins can take several GB which seems difficult practically. Can anyone give the best explanation of this situation? There are 2 methods to sort out internet traffic. 1. Global Exclude internal Server - This will make all the traffic to or from Internal Server to be excluded in Report Center. 2. Create a Custom Application rule based on Internal Server IP - This will make IAM recognize the traffic into specific application, then you can further filter in the report center by deselect the application you have created. Last edited by CTI LS 10 Apr 2018 15:20. The traffic could be caused by several reason. For instance, Windows update, Software update and so on. Besides, below is another example of traffic that will causes the Traffic to increase too. 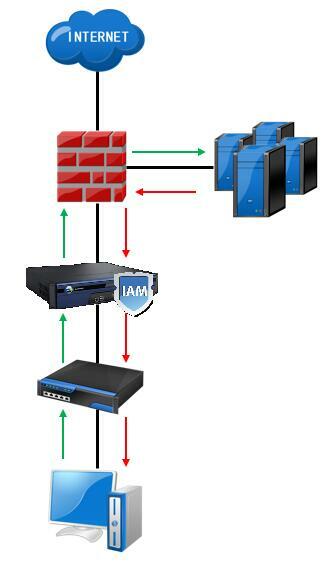 It passes through IAM WAN port, therefore it will be recorded in report center too.